Mishimoto are one of the leaders in aftermarket performance cooling products and offer to all levels of enthusiasts, from daily driver to track cars. Research and development is a big part of Mishimoto’s success as a cooling product manufacturer. This company anticipates the needs of drivers to ensure a high-quality product to fit your need. 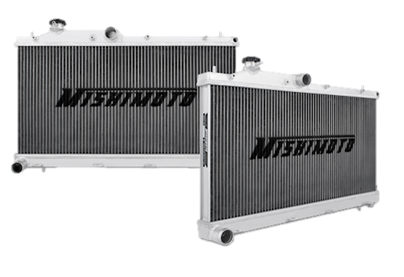 Mishimoto radiators are application-specific, designed to fit directly onto the vehicle and improve efficiency, thus enhancing engine performance. Customer satisfaction is one of Mishimoto’s key philosophies to build a brand customers can trust. To back this, Mishimoto boast a limited lifetime warranty across every product in the Mishimoto range, offering a replacement if a defect or issue occurs. Mishimoto offer everything for your cooling requirements, from radiators and intercoolers to silicone hoses and thermostats, all designed to improve your engine performance. Aftermarket intercoolers are essential to customised cars and track racers - you cannot swap out the engine for something bigger or use a fuel injector without also upgrading your cooling system. Not unless you enjoy the smell of burnt engine oil and and a stationary car. Mishimoto’s radiators provide up to 25% greater cooling capacity, letting you push your engine harder and for longer. This doesn’t just give you an edge over opponents, Mishimoto manufactures cooling systems that can be used for racing and normal driving, so it also helps on the commute, improving your engine’s longevity and durability. The excellent range of Mishimoto products that we’ve got in our selection includes enhanced radiators for increased cooling efficiency - up to 30% - and engine function boosting. Mishimoto intercoolers are put together after months of careful designing and testing to guarantee reliability, maximum performance and longevity on the street and the track. Mishimoto silicone hoses, made from a robust combination of high-grade silicone and heat-resistant embedded fibres, are an excellent replacement for your car’s stock hose, offering improved air induction. Their fan shroud kits have been designed to work with your stock coolant overflow tank, to ensure better airflow into the radiator. These kits have helpfully been designed to be as easy to install as possible, requiring no messy soldering, splicing or crimping. Established in the US in 2003, but bringing their production across the pond to the UK in 2011, Mishimoto is a company that has the expertise and passion to produce one of the best ranges of intercoolers available on the market today. The team at Mishimoto has eight years of experience in the engine cooling industry and is made up of passionate enthusiasts that are always developing and innovating. New designs and new methods of production contribute to better products. They always use durable and reliable materials, and carry out thorough testing to ensure longevity and customer satisfaction. This talented team’s commitment to quality and cooling excellence, and their brilliant manufacturer warranty has thoroughly impressed us at Tarmac Sportz and we’re very pleased to be selling their top-quality range of cooling components.